As we commemorate this season the sacrifice of Jesus, our Lord & Savior on the cross, we could rest assured that one day we could exchange this rugged cross for a crown waiting for those who will remain faithful to fulfill the will of God to the end. We are so blessed remembering and praying for you for your partnership with us in spreading the Gospel and extending His Kingdom here in this part of the world. Thank you so much to all of you. “666 is Real” The Bible clearly states that in the last days, nobody can buy or sell except one who has the mark or the name of the beast, or the number of his name … his number 666.” Rev.13:16-18. This powerful documentary film has been opening eyes of many regarding events that are about to take place. Praise God for souls being reached out as we show this film in different homes to evangelize our international contacts. 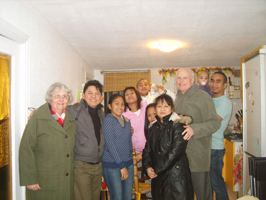 Several responded to receive Jesus as their Lord and Savior in various friendly home visitations we did. Marlyn one of our gifted evangelists in the group opened doors, shared her testimony and challenged them to surrender their lives to Jesus. These groups are now open for follow-up meetings. Ptrs. 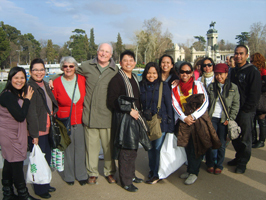 John & Shiela (fr England) strengthened the bond of love and flamed up the passion of the work of the Holy Spirit in the lives of our people. They stayed for a month ministering & participating in all our church activities. Praise God for their commitment to the F.I.R.E. 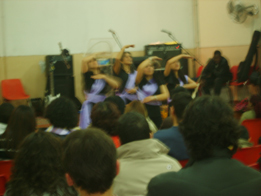 VISION ministries. Having their past loaded with religiosity, superstitions, witchcrafts and lots of doubts and fears our “From Curse to Blessing Seminar” became a tremendous blessing indeed. Generational sins such as gambling, adultery, fornication, lying, idolatry, etc. were dealt with & been cut off. Cursing words that marked lives were refuted with the TRUTHs of God´s Word. The openness and transparency helped built up confidence and trust one with another thus, the bond of love had been strengthened and as one body God´s liberation was manifested. Glory be to God! HOLY WEEK catholic practices here are such horrible experiences. Penitence is common & procession of idols mock the real essence of commemorating Jesus sacrifice on the Cross. We instead did the Seven Last Words Service giving exhortation in reference to the seven last words uttered at the cross with different speakers coupled with special music numbers in each excerpts and the Choir sang “AT THE CROSS” to culminate the service. On a Thursday morning, the group decided to do worship & prayer fellowship on a hill top by the park close by our place. Overseeing the mountains filled with snow from a distance, with artificial lake below, the sun brightly shining with fresh cool air breeze touching our faces, with some people passing by, we sang praises giving glory and thanks for what our Lord Jesus did on the cross to save mankind. It was such a wonderful time of a ‘prayer mountain’ experience. Afterwards coming down hill, we celebrated as one big family around a barbecue fellowship. 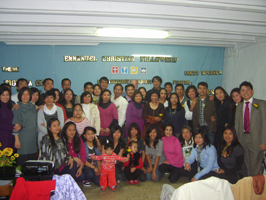 The Menorca Church celebrated their 6th Anniversary and Rey was their invited speaker. Praise God for the continual growth of this ministry. In Mallorca, Rey is scheduled to visit on April 23-25 to conduct leadership training in a pioneering church. Praise God for the extension of His kingdom through church planting. Taking a break at the ‘Retiro’ Park. Rey spoke at the Menorca Church 6th Ann.